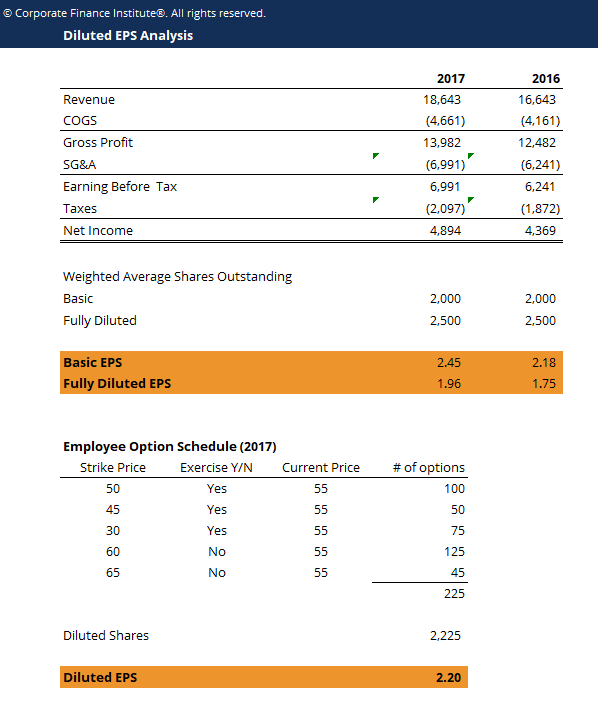 This diluted EPS formula template shows you how to compute the diluted earnings per share using information from income statement and an employee option schedule. The Diluted EPS formula is equal to Net Income less preferred dividendsCost of Preferred StockThe cost of preferred stock to the company is effectively the price it pays in return for the income it gets from issuing and selling the stock. Download the free calculator template to determine the cost of preferred stock based on the company's preferred dividend payment, share price, divided by the total number of diluted shares outstanding (basic shares outstanding plus the exercise of in-the-money options, warrants, and other dilutive securities). Why do investors and analysts calculate diluted EPS? The reason that analysts and investors calculate diluted EPS is that basic EPS may overstate the actual amount of earnings per share that a common shareholder is entitled to. Companies frequently have dilutive securities outstanding like options and warrants that will increase the total number of shares outstanding when converted. Since the conversion of option into shares won’t add any additional net income to the business, the increased share count makes the conversion dilutive. Options may have been granted to employees, for example, that are in-the-money (strike price is below the current market price) but have not been converted yet. If options are in-the-money, they should be accounted for in a diluted EPS calculation.